ZEN pilot project Campus Evenstad. Photo by Tove Lauluten. The Department of Applied Ecology and Agriculture of the Inland Norway University of Applied Sciences (Høgskolen i Innlandet) is located at the Campus Evenstad. It is located in a rural area in the Stor-Elvdal municipality. The campus accounts for 61 000 m2 of land with 17 buildings (10 000 m2 gross internal area (GIA)) with different uses: administration, education, and sport, student housing and building operation. The construction of a new administration and education building with ZEB-COM standard and a GIA of 1 141m2 between 2015 and 2016 was one of the ZEB Centre’s nine pilot projects. 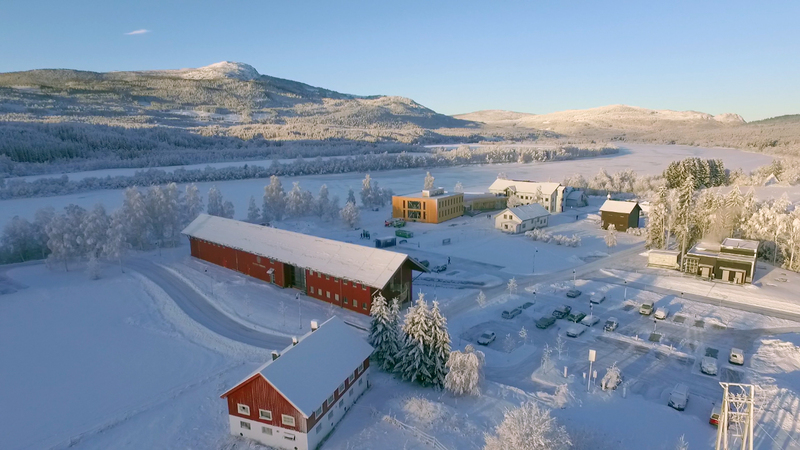 The campus is located in a rural area in the village of Evenstad, 70 km north of the city of Elverum and 20 km south of Koppang, a regional service centre. Surrounded by farmland and the river Glomma to the west, there are few other buildings in the area. Involved stakeholders: The Campus is owned by the Norwegian state with Statsbygg as the public owner, and responsible for the administration of the real estate. The Inland Norway University rents the area from Statsbygg. The student organization Studentsamskipnaden owns the two dormitory houses on campus which are built with passive house standard and include in total 117 residential units for students. The goal is to develop a ZEN with regard to campus operation. This goal incorporates the optimization of energy production, management and use. Campus Evenstad aims to be a regional energy hub and a demonstration plant for renewable energy – the Campus Evenstad Energy Centre (CEEC). Development of a smart energy management system to reduce the peaks in energy consumption and thereby the load on the net. The aim is to increase the amount of self-produced energy. Optimize the interplay between different electricity (photovoltaics, CHP, grid) and heat (CHP, solar collectors, bio-based and electric boilers) sources. Energy storage in batteries in a network of buildings with variable power requirement during the day, week and year. Application of the living lab methodology to engage campus users in activities which minimize energy consumption and greenhouse gas emissions.